Sweet Almond oil (روغن بادام شیریں) had been used extensively for its health benefits and as a beauty aid much before science caught up with the goodness of this seed oil. This amazing oil is extracted from raw almonds. It owes its benefits the generous amounts of monounsaturated fatty acids, vitamin E, potassium, proteins, zinc, and a number of other vitamins and minerals it contains. As it contains vitamins, Almond Oil can be used in numerous home remedies which can be beneficial for one’s health in multiple ways. Enriched with vitamins E, A, and B, this miraculous oil seals the moisture in the skin and also improves absorption. A sure shot remedy to get rid of dark circles is to massage almond oil under your eyes before you hit the sack. The vitamin E in the almond oil will rejuvenate the skin, and with regular use, lighten the skin under your eyes. Regular use of almond oil will also reduce wrinkles and crow’s feet around the eyes. Regular application of almond oil on your skin makes your skin feel younger and fresher within no time. The vitamin E and fatty acids present in this oil reverse and prevent signs of aging. It not only helps skin renewal but also fights wrinkles. The skin tends to look dull due to the accumulation of dead skin cells caused by external factors like pollution, dirt, sweat, etc. The moisturizing property of almond oil loosens the impurities and the dead skin, making it extremely easy to remove them. You can make a scrub by mixing a tablespoon of almond oil and a teaspoon of sugar. Massage this scrub on the face in small circular motions to get rid of dead skin cells and blackheads. Almond oil is a time-tested remedy for all kinds of skin problems like acne, psoriasis, and eczema. It soothes irritation and relaxes the skin. Almond oil acts as a natural sunscreen. It has an SPF 5, and it not only prevents tan and sunburn, but also reverses the effects of the sun. The vitamin E in almond oil nourishes and shields the skin from harmful rays of the sun. Almond oil’s rich vitamin content and moisturizing properties can make your lips soft and pink. Every time your lips feel rough and chapped, you can just dab on on a little almond oil, and you will be good to go. Unhealthy hair is never a good sign. But the dirt and pollution, along with our busy schedules, make it worse. Regular massage with this oil not only helps the growth and health of your hair but it can prevent split ends too. Almond oil effectively cures dandruff by removing dead cells from the scalp.. It also nourishes the hair and keeps all kinds of hair troubles at bay. Almond oil is a great emollient that cleanses the skin and removes dead cells. This quality also helps almond oil fight dandruff and keep the scalp clean. Almond oil is loaded with monounsaturated fatty acids. These fats boost heart health and prevent cardiovascular diseases. Sweet almond oil is rich in folic acids, unsaturated fats, protein, and potassium, all these have been proven to be beneficial to cardiac health. Almond oil helps keep Type 2 Diabetes at bay, restores liver health and maintains a healthy heart. It also regulates blood pressure and maintains the cholesterol levels. Regular consumption of almond oil makes the body stronger and helps it fight common infections. It also proves to be an effective laxative and aids digestion. It is a great source of omega-3 fatty acids and also contains a good measure of potassium. Almond oil is known to nourish the nervous system. Add a few drops of the oil to a glass of milk and drink this every night before you go to sleep. Long nails look beautiful only if they appear healthy and not brittle. If you tend to bite the edges of your nails, it’s time to strengthen them with almond oil. For healthy and strong nails, massage them with a few drops of almond oil daily. The potassium and zinc present in the almond oil strengthen your nails and hydrate them, making them less prone to breaking. Adding almond oil to your food can prevent colon cancer. Almond oil is full of fiber, which helps in proper movement of food in the colon. Almond oil is rich in folic acid, which reduces the chances of birth defects in newborns. It also ensures that your baby goes through healthy cell growth and tissue formation process. Almond oil also ensures your newborn won’t suffer from neural tube defect. 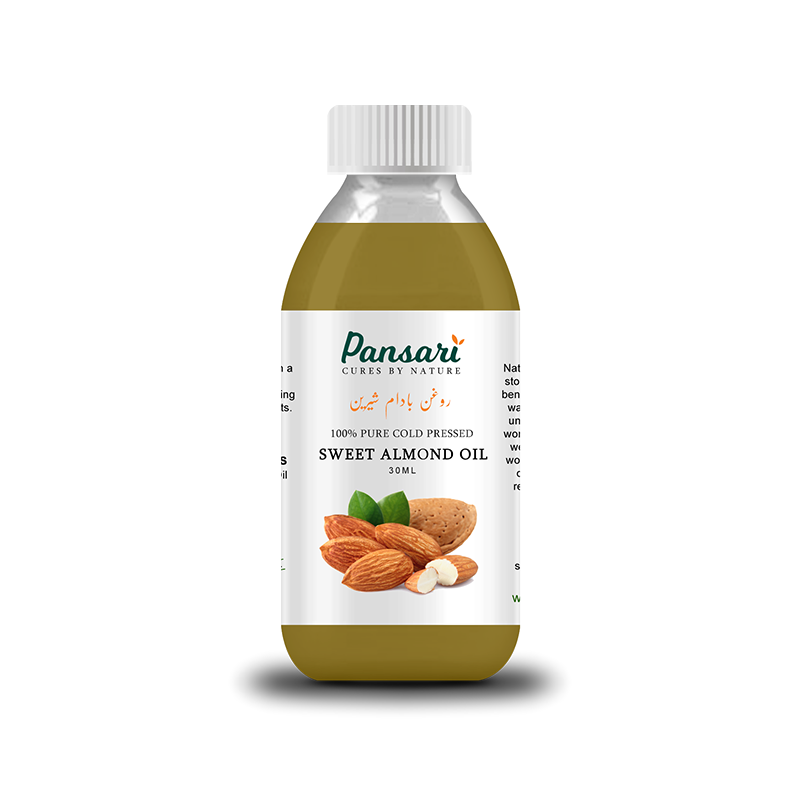 NB: Pansari's Sweet Almond oil is pure oil and can be used for edible purposes too. The almond oil is good quality but there test is not sweet. Almond oil is soooo good so pure and smell just wow..